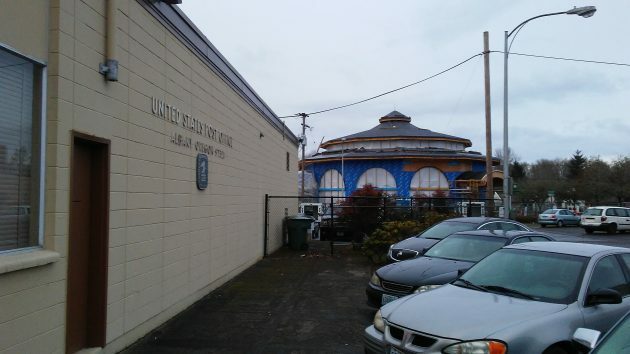 The Albany Post Office, built in 1963, now finds itself facing the Albany Carousel construction site. Mayor Sharon Konopa would like the Albany Post Office to find another site in town, but the U.S. Postal Service has no plans to move and says it would find it difficult to do so. The mayor told the Albany City Council on Jan. 23 she would work this year on exploring a relocation of the post office from the city block it occupies at 525 Second Ave. S.W. As I understood her thinking, once the Albany Carousel brings additional crowds downtown, aggravating the parking situation, the post office might be eager to move. She has not yet done anything to follow up, but she told me she was impressed by the number of people who let her know they agree that a move would be best. I looked into what the Postal Service thought of the idea. In a nutshell: Not much. At the post office, the officer in charge had heard no talk of moving. She had only been in the job for 60 days and referred me to Peter Hass, a press spokesman for the Postal Service. Hass called me back Tuesday from Phoenix, Ariz., where he handles press inquiries involving the service’s Portland District as well as other states. The service had not heard from the city, he confirmed. And in any case, establishing a new main post office in Albany would be “very difficult given our financial situation.” Nationwide the service has been running deficits for years and, for fiscal 2015, reported a $5 billion net loss despite an increase in revenue. Hass told me that the service has to add about a million delivery addresses every year, and yet the overall volume of mail is declining. The Albany Post Office was built in 1963. For may years the office leased the property, but in November 2010 the Postal Service purchased it. The $34,065 purchase price listed in Linn County records was obviously not the market price for the entire site. Probably it was the final payment on a lease-purchase contract. The post office parking lot on Jan. 25. Spaces were hard to find. Maybe she can bell the cat? Nice reporting Hasso. I though the statement reported by Mayor Kanopa was odd last week. I don’t know why she would mention something like that before talking in directly and in private with the most important party involved. So unless the city wants to buy the old Safeway and then do a property swap with the USPS, I don’t see how this could happen. I would be opposed to tax dollars being used for such a purpose. I am content with the Albany Post Office and Albany Carousel existing side-by-side. I fully support both endeavors. When the Albany Carousel was planned, the planners knew about the limited parking and the location of the post office, so this is not a new concern, nor something that needs fixed with more dollars. The present situation will be cozy, but fine. The gummint doesn’t have to pay their taxes. Why should we? Don’t be dense: WE are the government, and if you assess property taxes on government facilities then all the taxpayers will have to pay more to cover that additional cost. That’s a waste of time, paperwork and processing costs – a circular process. On the other hand there are a lot of non-profit entities that pay no property taxes, most notably all the churches. If they paid property taxes, then their members would be on the hook, not the entire community.. But in this country our history is to NOT charge those entities even though they also benefit from police, fire, and schools which is where the biggest portion of your local property taxes go. wasteful project, probably with CARA money, which IS OUR MONEY. Perhaps the USPS could be convinced to take a run at some CARA dollars. If CARA is truly dedicated to eliminating unsightliness downtown, then where better to invest than in the Post Office building. It seems likely the Trumpsters will privatize the mails soon and everyone knows CARA likes to help out those in the Private Sector in downtown who own tired buildings. Hang on to the dream. 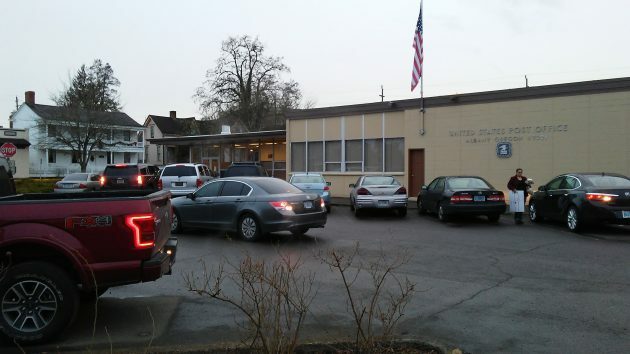 The USPS could be hustled on out, replaced by a parking lot soon. Hasso, might I suggest you pedal your bike up to Salem’s Merry-go-Round which is located in a particularly difficult spot, not unlike Albany. Ask them about parking….especially in the summer. You know! It is not hard to visualize our dearest donnie pulling a stunt such as that. Actually shutting the USPS. Then auctioning off any assets to UPS/FED EX/DHL etc. for pennies on their estimated dollar value. Then, NO Saturday delivery unless we pay a special high fee for that Saturday delivery. Coming and going ‘cuz you’d pay a higher fee for receiving too. Long lines at the rundown Albany P.O. will be replaced by long lines and $1 postage per letter at shiny new UPS stores that pop up like Starbucks on each corner. But Albany could then raze the old P.O. for parking. Fun times! Seems like the mail sorting could be done on the carousel. Its a win-win-win. Many original carousel had brass rings you could grab as the carousel was spinning. You then tried to throw the ring into a slot as the carousel is spinning. The original carousel on the Santa Cruz boardwalk (on the National Historic Register) still has this feature. So here is how it would work: as you ride the carousel, instead of trying to grab a brass ring, you grab a bag of mail. But instead of just one try with a brass ring you get multiple tries with that nice big mail bag. Grab a letter, this one is for Salem, try to hit the Salem slot as you spin by. Oh, here is a fundraising letter from the Republican party. Try to hit the hazardous waste disposal slot as you spin by. So the carousel riders get a variation of the brass ring game, and sorting gets done for the post office, so that another parking lot can be created in downtown Albany. I think I am going to have to patent this idea tomorrow before Trump shuts down the patent office as unnecessary regulation…..